When your Laundry Egg pellets have reached half their original size and you have no more bags of pellets - it is time to top up. Don’t throw your Laundry Egg & tourmaline pellets away, reuse and refill. The 210 wash refill pack contains 3 bags of mineral pellets which will last the average family for approximately one further year of laundry. This works out at just under 4p per wash! Also available in Fragrance Free and Fresh Linen. The Ecoegg cleaning pellets are non-toxic and do not contain any harsh chemicals, petrochemicals, enzymes, optical brighteners or phosphates. Contains: > 30% Anionic surfactants, 15%-30% Non-ionic surfactants: also contains perfume. Simply place the Ecoegg Laundry Egg on top of your laundry in the drum of the washing machine, and wash as normal - no washing powder or liquid needed. 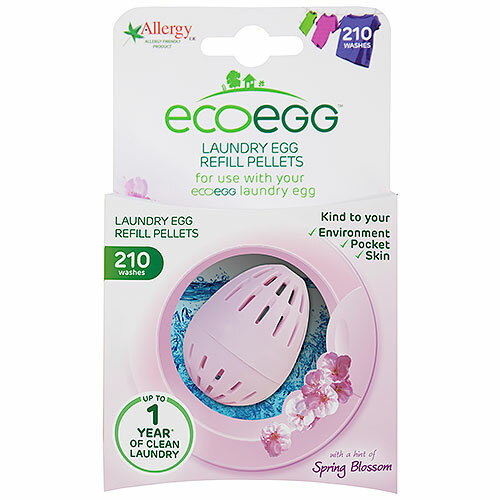 It`s the clever way to wash.
Below are reviews of Ecoegg Laundry Egg Refills Spring Blossom - 210 Washes by bodykind customers. If you have tried this product we'd love to hear what you think so please leave a review.